Is there anything more decadent than chocolate covered cherries? This creamy chocolate cherry smoothie was designed to tickle your taste buds and rival the best tasting chocolate covered cherries. This is one of those smoothies that tastes so good you have to remind yourself that it’s also quite healthy. Cherries and cacao (raw chocolate) are both loaded with antioxidants, both contain a good amount of magnesium, and both have been shown to be heart healthy. In conjunction with the other ingredients, this smoothie provides plenty of vitamins, minerals, and dietary fiber to pass as a super healthy snack, dessert, or meal. There are a few more add-ons than normal listed below because I find you can extend this smoothie in several different directions. Personally, I love using maca with cacao, and find myself adding more coconut oil to my smoothies as of late for more calories and sustained energy. I rarely get hunger pangs around lunch time after a morning smoothie with a tablespoon or two of coconut oil. Add in your favorite chocolate protein powder and you’ve got the perfect after workout smoothie. Whatever you do, just make sure to have fun and enjoy the smoothie making process. Note, I made this with almond milk and used that to determine the nutritional information below the recipe. Enjoy! Place all of the ingredients into your high speed blender and blend on high for 30-45 seconds or until the desired consistency is reached. 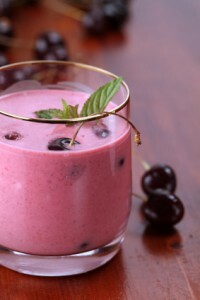 If you try this chocolate cherry smoothie please leave a comment below. Happy Blending! This is such a great recipe. I just posted a link to it on my site’s fb page. Can’t wait to try some of your other recipes. Hey Monica, glad you like the recipe, it’s one of my favs, and thanks for sharing on your site’s Facebook page. Cheers! Hi, I tried this smoothie out and love it! I added a half banana, and didn’t have yogurt, but it still came out great. Thanks for publishing this recipe! Hey Amber, using banana instead of yogurt was a nice improvise. Thanks for sharing. I made this with Sun Warrior Plant Based Raw Protein powder in Chocolate and some frozen banana and it was delicious. Thank you! Banana and Sun Warrior chocolate protein, nice Carma! I just wanted to say that this is the best cherry smoothie I’ve made, hands down (and I drink smoothies every day for breakfast, so I try my fair share). Love this recipe! That’s quite the endorsement for this smoothie :) It is a tasty dude. Thanks for sharing. Chocolate almond milk and chocolate Greek yogurt, very nice! A young, athletic, recipe-diva – go on with your bad self :) Thanks for commenting, always nice to hear people are enjoying my recipes. Thank you for sharing your chocolate cherry smoothie. It was delicious. I followed the recipe and then added chia seeds and coconut flakes. I will definately add this to my favourite smoothies list. Hi,I just made your chocolate cherry smoothie and it tastes really good,I have all of the ingredients that I put in it but after I made it I forgot to put the chia seed powder in it and I am slowly drinking and I am now going to go put some chia seed powder in it. Nice to hear you like this smoothie, Kim! hi as the cherries are not in season could I use the glace cherries (use for cakes)if i wash off syrup..as really want to try this recipe..
Sure you can use glace cherries, Lisa. Let me know how your smoothie turns out.